THE TAKEAWAY: There’s lots of money out there, and you don’t need to be a rocket scientist to get a share of it. You do, however, need to be organised and clear about what you want. Tens of billions of dollars in grants funding is provided each year. The trick is to make sure your organisation gets its cut. The first and most important thing to know about grants is that they are generally given for projects or programs, not for your core funding – wages, administration costs, etc. are almost always excluded unless these are part of the project or program. This is why Our Community recommends you have a mix of funding sources, drawing from all seven pillars of fundraising if you can. Grants are generally tied funds, while money you draw in from membership fees, fundraising events or sale of products can be used any way your organisation wishes. Relying on grants alone for your continued existence will put your organisation into a precarious position, reducing your flexibility and increasing your vulnerability to a sudden change of direction by a previously reliable funder or funding source. 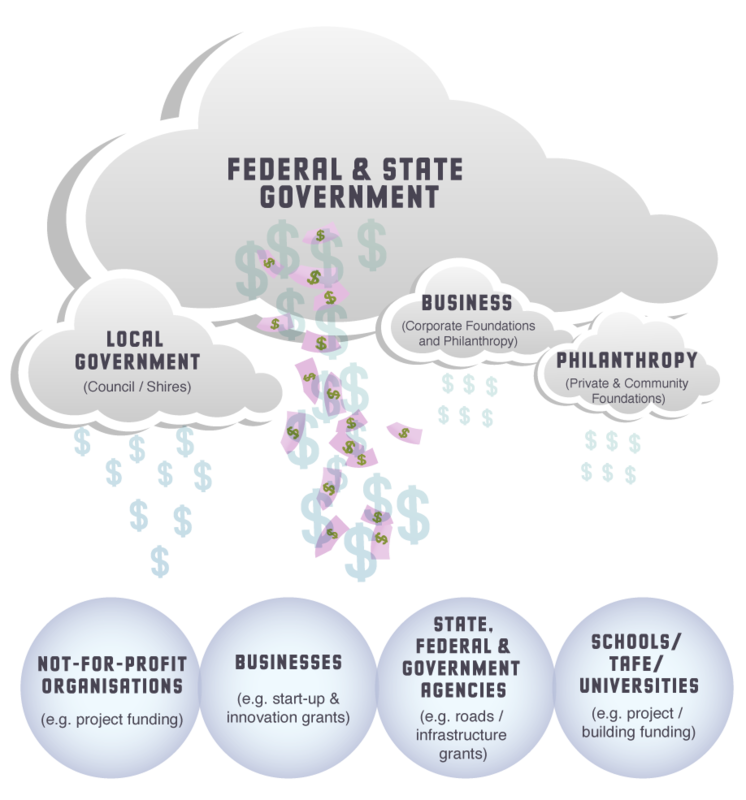 All levels of government - federal, state, and local – distribute grants, as do many philanthropic and community foundations, some other not-for-profit organisations, and some businesses. All of these types of funders have different drivers for their grantmaking (for example, government grantmakers are usually driven by policy outcomes, while corporate grantmakers may wish to create a better image for their company, for example). OUR TIP: Make sure you understand the motivations of the grantmaker you are targeting for funds. It will help you to better target your application and reporting. 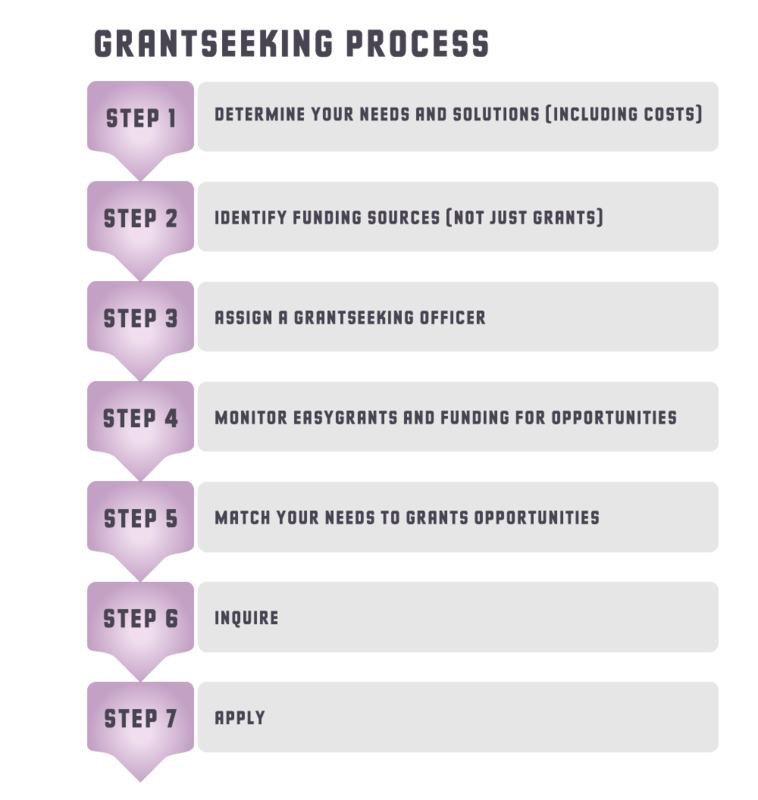 Grants budgets vary greatly from funder to funder and from program to program  one program may have only a couple of hundred dollars to give away; another tens of millions. And each individual grantmaker will differ too in how they decide who is eligible for their money, how they go about picking the “winners”, and what they ask of grantees in return for their cash. 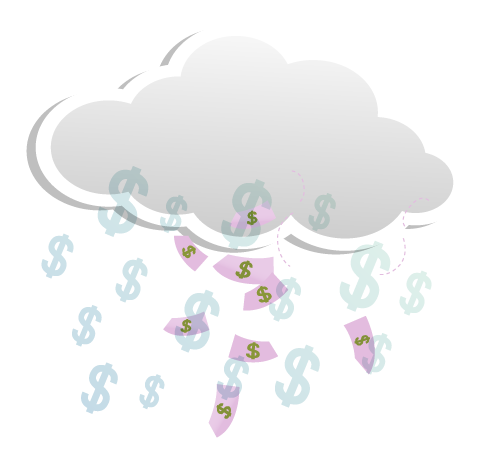 Before you accept any money from a grantmaker, you must be sure you have the capacity to carry out the terms of the contract, and after you get the money you have to deliver exactly what you said you would deliver in the timeframe that you said you would deliver it in. If funders believe you can deliver projects on time, on budget, and in the same form as they were approved, you’ll have more hope of achieving a second or third grant, or even ongoing funding (though it’s wise to treat every grant as a one-off). OUR TIP: You must tell the grantmaker if you want to alter the terms of the grant; that is, if you ever want another one! The best way to negotiate the world of grants is to think about your needs before you start thinking about what grants are available. Hold a brainstorming session and make a list of all of the things your organisation would like to do, if only it had the money. Make it a living list that's accessible to key people within the organisation and can be added to and refined as new needs arise and old ones subside. Use this list to inform your decisions about which grants you want to apply for. 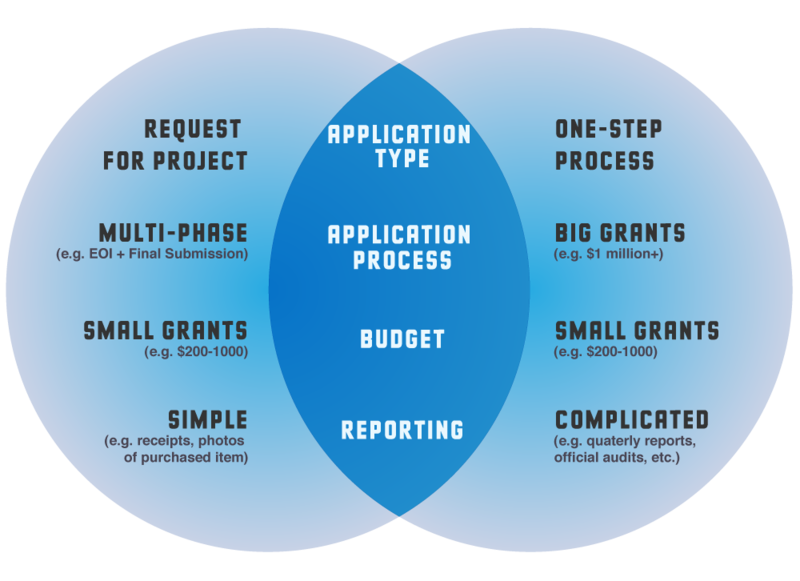 The diagram below (a snapshot of the Grants Planning Tool - see below) will help you to work through this process. We also recommend that you begin a process of collecting all the things that you are going to need to make a grant application – your organisation’s incorporation details, insurance certificates, mission statement, etc. – as part of your own customised Grantseeker's Template. We recommend you keep both an online and hard copy version of your Grantseeker's Template, and keep it up to date so you have all that information and all those documents ready to insert at a moment’s notice. Not sure what to collect? We’ve prepared a sample template to get you started. OUR TIP: The Grantseeker's Template is a real time saver but don’t pre-prepare everything. Every application you make must be tailored to the particular program and grantmaker you are applying to. Grantmakers have a good nose for copy-and-paste applications and they don’t like them. EasyGrants is the newsletter of the Funding Centre – it provides a menu of fundraising news, tips and tools, plus a comprehensive list of all the grants in Australia that fit your organisation’s profile and search preferences. This is the key tool you need in order to ensure you don’t let a grant opportunity pass you by. A subscription to the Funding Centre also entitles you to grants alerts and to access to the Grants Search Tool so you can search the database any time you choose. Sign up for a subcription to the Funding Centre. Our Community recommends that one or two people be assigned the job of receiving and going through the EasyGrants Newsletter when it's delivered each month to identify which grants are coming up that could be tagged to projects you want to do. Make it a permanent item on your board agenda to ensure the task doesn't get overlooked.